This article pertains to WHM, a feature only available to VPS Hosting, Dedicated Hosting, and Reseller Hosting users. Shared Hosting users do not have WHM access. See our page for more information on Shared cPanel Hosting. One of the more important features within WHM is the ability to create individual cPanel accounts. Learn how to resell your own hosting accounts in WHM with the tutorial below. Enter the main domain name on the account, set a cPanel username and password for it, and then enter the email address to be associated with the account. WHM allows you to create packages, which make it easier to manage cPanel accounts. For Example, you may have a "Power Plan" package like InMotion Hosting offers. Within that package you could set limits such as the number of addon domains to associate to the account. If you don't have any packages set, select the "Select Options Manually" option and set those limitations now. Choose the cPanel theme to assign the user (InMotion Hosting currently uses x3) and select the appropriate language for the user. Decide how the domain's nameservers should be configured on the server. If the nameservers specified for this domain name are going to be on another server, choose the option "Use the nameservers specified at the Domain's Regsitrar"
Decide how the server handles email for this specific domain. For example, should it attempt to deliver the email locally or should it look at the external MX records and decide? It's recommended to use "Automatically Detect Configuration" if you're not sure about this setting. After you have filled in all of the details above, click the "Create" button at the bottom of the page. Congratulations, you have just created a new cPanel account! I was reviewing your document and looking at the Images. I noticed you still show the wrong DNS server. You still show ns.inmotionhosting.com and ns2.inmotionhosting.com I believe these are wrong. I asked Suport and they pointed me to NS1..... and NS2..... When are you going to update your images? Actually, they are both correct. Our older name servers were just NS and NS1. Today, our support personnel use NS1 and NS2, but using NS and NS1 will still point to our servers. I tried to create an account through WHM for what was, an add-on account on my original hosting account which I updated to primary on that account because I moved the original account to VPS. I received an "can't create account because it already exists on the Apache server" so, how do I get the secondary account on my vps server as a separate account. That error means the domain you are trying to create an account for already belongs to an account on your server. You will need to remove the domain from your existing cPanel accounts before you can create a new account for it. How can i get my own WHM?? You would need to have a VPS or Dedicated server account. Reseller account admins also have access to WHM, but it is in a more limited sense. Check out the InMotionhosting.com home page for more information on the different account types. It looks like WHM is redirecting to the server default page. I advise contacting your web host to see if they can access the account, replicate the issue, and get you more information about why it might be happening. Thank you...I'm trying to create a cpanel for the same domain..can I do that..I want a separate section for testing v7 php. Each cPanel must have a different domain name. This means you cannot have two cPanels for the same domain name. Before creating the account, I purchased a domain from my AMP under Domains>Register new Domain. I changed the nameservers to point to my reseller hosting account. Did I do something wrong? Why I get that message in WHM every time I try to create a new account? By default, creating a cPanel does not require a new, unique IP address. You may need to contact Live Support so they can see what your current VPS configuration is. Hi Guys, I created and deleted a few packages in WHM and now when I try to create a CPanel account even a fully unlimited package are unselectable, saying "Cannot use due to limits". Are you using a package in the creation of a new cPanel or are you using selecting manually? can you successfully create a new package? Deleting packages should not have any effect on each other. Did you change anything else at the same time that may have affected that? Hi, quick question, I noticed in the vid tutorial when you went to their cpanel account domain/cpanel you weren't hit by the insecure notice. How did you bypass this? Same happens in webmail thorugh account setup via VPS. Thanks for the question. I went through the video to see what you were talking about. The insecure notice is normally there because you're trying to use the https version of the login instead of the non-https version of the login. In the tutorial, you will notice that he using example.com:2082 - that is the non-https version of the login. It will not have the security issue messages. You can remove the security issues by having a valid SSL file for the domain that you're trying to access along with setting the service SSL settings in WHM (accessible only with root access). I hope this helps to explain the issue! If you have any further questions or comments, please let us know. Many thanks for the reply Arnel. Ok so that makes sense. Currenty the server forces the sll on cpanel and webmail, so using the ":2082" doesn't make a difference. I have an ssl installed on a domain which has a cpanel acount on vps, the website is fully ssl secure, but still have the problem on cpanel and webmail with the security notice. You say "You can remove the security issues by having a valid SSL file for the domain that you're trying to access along with setting the service SSL settings in WHM (accessible only with root access)"
Can you please elabrate on setting the service ssl settings in WHM ?? Once again thanks for the assistance. Here is a helpful link to the official cPanel documentation on how to Manage Service SSL Certificates. Great video! Learned a lot. My question has to do with passwords on new cPanels. Suppose a new client wants to change their password; can they do that? And won't that prevent access by the WHM administrator? The client can change their cPanel password from within the cPanel itself. It will not hinder the WHM Admin from getting in, however, since they don't need it. The WHM allows them to access directly from a list of accounts. In fact, we recently wrote an article about accessing cPanels from the WHM. If I have full controll of the site for the customer do I need to have a cPanel for each domain? What is the disadvantage of having seperate cPanel for each? With reseller program, are the domains I purschase for clients treated as addon domains? with seperate Cpanel are they addons? Thank you for contacting us. Typically, you would create a separate cPanel for each customer, where they can add additional domains and host other sites (you can set a limit in WHM) . If customers shared a cPanel they would have access to each other's files/databases, which is insecure and not recommended. Each customer will need a separate cPanel, but they can add multiple domains to it, and host separate sites. Could you please be more spesific about how to resell/host another website without getting too much deep in details.. Creating another cPanel account for your customer allows them to have full access to upload and modify their site. All you would need to do is to bill them, create the account, and provide support. cPanel accounts should not be used to log into WHM. You must have a WHM account. On shared hosting this isn't possible. If you have a VPS or Dedicated server you should be able to use the main login for cPanel as well as WHM. When I'm trying use cPanel account to log in WHM, it says 'The login is invalid'. Explain please, how can I create a WHM account. I have created a cpanel account on whm, but i can't access the cpanel on the browser. how can i access this my brothers? Please helpm me, i'm a beginner in this field. Sorry that you're having problems getting into the cPanel. We would need to know what URL and more information about your account in order to troubleshoot. If you wish to handle this privately, then please submit a ticket to our live technical support team. Thank you members, i wouldlike to know more on hosting issues because I'm a beginner in this field. Are the reseller options available on VPS servers? I would like to deletgate one user the ability to create accounts, and the above article says to enable reseller options, but I dont see them in the video and/or on my site when I create a new account. Thanks for the question. The reseller option is not available on a VPS account, though you could always create new accounts with WHM. The reseller option is different from VPS, due to the fact that you can obtain root access and FULL access to to the VPS account files. I hope this helps to explain it for you. Let us know if you have any further questions or comments. I have a dashboard account and tried login through it after a month and it was perfectly still available.. I tried to login to the main site and it says my username and password is invalid.. Pls I need a link to setup my cPanel and where I can register fully for the main site.. Thank you ..
We are happy to help. What are you specifically trying to log into? Are you trying to get into the WHM? the cPanel? the AMP? or part of your website such as the admin dashboard? Im trying to get an account with cPanel and WHM. I really don't need the dashboard. A link will do if I can get direct access to these and also I tried to install the cPanel on my system but the download was not easy and the main reason for this is because I don't know how to creat link via cPanle and it gives me concern because I really need this. Sorry for the ongoing confusion. The cPanel system is the default interface for web hosting customers to get to their web hosting server account. If you have a hosting account, then you would have cPanel access to your server. If you are trying to get an account created and you have either a reseller account, a VPS or dedicated server account, then it is possible to CREATE a cPanel account through the WHM interface. It's unclear when you say," I want an account with cPanel" because that interface is a default for all hosting accounts. You should not be installing a cPanel interface as it's part of the server account. If you're trying to simply get SHELL access, it is available, but the dashboard interfaces will also be available - you can't get one without the other. To give a quick summary, there are three account interfaces depending on your hosting account: the Account Management Panel (AMP), cPanel and WHM. All accounts have AMP and cPanel access. Only the reseller, VPS and Dedicated server accounts have WHM access. I hope that helps to clarify the issue. If you require further assistance with your request, please let us know and we would be happy to help. I just created an account. But when I try to login to the Cpanel using the username and password of the new account I get authentication error saying the login is invalid. I tried changing the password but I still get the same error. Authentication error means either the username or password is incorrect for the cPanel you are trying to access. 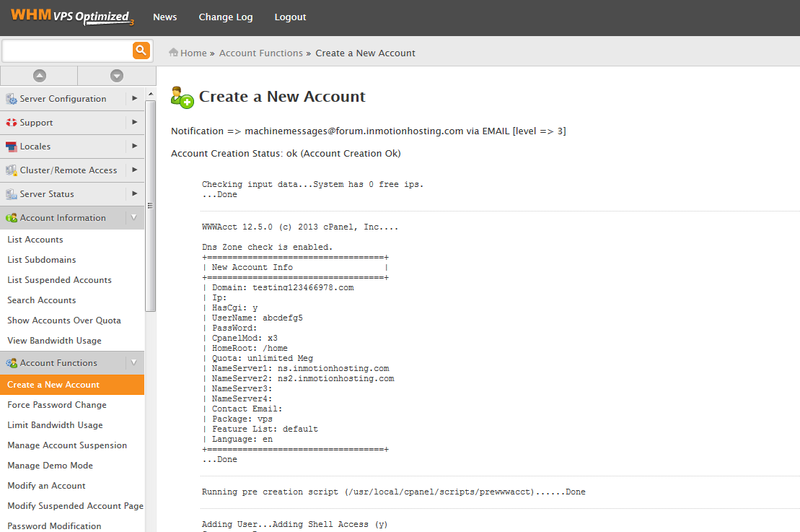 To check the username, you will want to log into your WHM, go to Modify an Account and select the cPanel you created. You are able to see the username there. To change/confirm the password, log into the WHM, select Modify Password, then select your cPanel. You will not be able to see the current password, but you can reset it to be sure it is what you desire. From there you should be able to log in without issue. How do you edit the Notice Board on my customer's cpanals from the WHM? I tried everything but i just can't find a solution. My reseller account provider said its white labal, however it doesn't seem like it. There is a tool called "Modify cPanel/WHM News" on the left hand side bar in the WHM. Look for that and that will enable you to modify that section. Please add some snapshots for the 3rd point settings or there default settings that helpful for new user.Also add some error solutions like if account not create give failed status then what the reason behind that error. Thank you for your suggestion. Were you able to watch the youtube video at the top of this article? It goes into the options in more detail on the options. 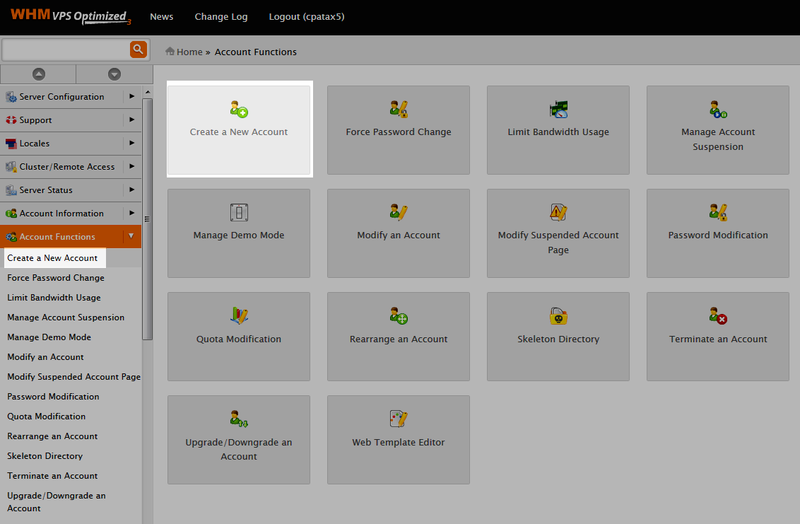 Also, here is a link to the Official cPanel guide on creating a new account. That page includes links to detailed setting information written by the creators of cpanel/WHM. We are more than happy to help you with any errors you may see, but will need to know the message. Feel free to post any errors here and we can help troubleshoot the issue. This is meant as constructive feedback, I'm not disgruntled and will find my answers soon from tech support through chat, which so far works really well. The documented process is good and was helpful...to a point. After the cpanel account is created, what are the steps to actually use it? What is sent to the customer so that they can activate their account? How can the reseller test/QA the account to make sure it is working BEFORE the customer is given log-in info that does not work? What do I as admin do when the log-in info does not work? I've read the different ways to access cpanel. None work for the new account I've created. Obviously, I'm doing something wrong, as your system seems top notch, I just can't find what. It would be helpful if the documentation included ways to verify successful account/cpanel creation. The next reseller Tutorial is Suspending the account. It would also be helpful if, somewhere between Create and Suspend, there were instructions for Activation and Use. Thank you for the feedback, it is always welcome and helps us to improve. I will answer your questions here for you. After the cpanel account is created, what are the steps to actually use it? What is sent to the customer so that they can activate their account? Although I have created dozens of accounts via my own server, I do not recall an initial email being sent. I tested it specifically for that and did not get one. Our own setup system sends out an email when we confirm an account, but that is not via the server. You may want to set a policy to send out your own as well so you can give initial cpanel usernames and passwords, etc. How can the reseller test/QA the account to make sure it is working BEFORE the customer is given log-in info that does not work? You can log into the cpanel with the same methods the user would use above. What do I as admin do when the log-in info does not work? If the login info does not work, you can always change the password from within the WHM. Look for the Password Modification tool in the WHM. I've read the different ways to access cpanel. None work for the new account I've created. Obviously, I'm doing something wrong, as your system seems top notch, I just can't find what. It would be helpful if the documentation included ways to verify successful account/cpanel creation. I will definitely add that to the Article Updates list I have so that this information will be more readily available in the future. Thank you again for the feedback! Great tutorial - it makes a lot of things clear! I can see how you set up additional individual cPanels but the problem I'm having right now is that the initial cPanel (reseller?) is not set up (brand new WHM install). Do you have any tutorials to show how to set up the main cPanel? Thank you for your contacting us. I am not exactly sure what you are asking, but as a Reseller you have the ability to customize the branding of your cPanel in WHM. This allows you to modify the look and logo of your customer's cPanel, and webmail interface. You can also create separate cPanel packages, and select which features will be included. These guides are part of our helpful Everything Reseller page. Can you please be a bit more specific about what it is that you're trying to accomplish? This guide covers how to create a cPanel account in WHM. Are you trying to find info on installing cPanel and WHM on your server?